I did find it hard to suspend my disbelief with the casting in this film, though. I mean, even if Lady Gaga is playing some nobody, it’s not like I have to stretch my imagination to think that her character would suddenly become a music superstar almost overnight. Of course, its predecessors also cast famous singers like Judy Garland (1954) and Barbara Streisand (1976), so I can’t blame it for taking the same path. 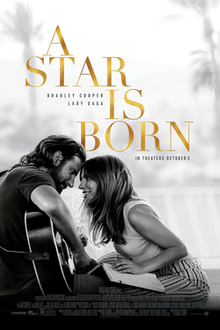 Perhaps part of my disbelief comes from how this movie was filmed more like a Lady Gaga concert with little bits of plot dropped in between the songs. If you’re into that, great, but I’d rather see a concert live instead of via the big screen. Despite what it is, A Star is Born packs an emotional punch. Since it bangs you over the head with the importance of words, you start to pay attention to what’s said, both in the dialog and in the lyrics of the songs. Plenty of the songs are catchy, and (ironically enough) Bradley Cooper’s song that starts the film off is the one that’s primarily stuck in my head (instead of any of the ones by Lady Gaga). A retread that’s still somewhat relevant, I give A Star is Born 3.0 stars out of 5.